When I was about 17 I got a job in a sandwich shop in Slough. I know, not very glamorous I hear you say, but this was not just any sandwich shop; it was a yuppy sandwich shop! In the era of ‘The Sloane’ we offered masses of different sandwiches, all made to order on purpose-built units a bit like Welsh dressers, with refrigerated shelves which held row upon row of margarine tubs to enable easy reach of all the most popular fillings of the 80’s; pesto, mozzarella, banana, pastrami, hummus, cream cheese, and coronation chicken. Once made, each sandwich was wrapped on a heated metal stand with the roll of cling-film attached to a wire at the back making it quick and easy, the warmth swiftly sealing the plastic wrap. All very high-tech! Our hundred or so filling options were printed onto a posh little leaflet designed to perfectly fit into a filofax, with the classic 6-punch holes already perforated (genius, I thought) and displayed in stands on the shop counter. During its heyday the queues would stretch out the door around the block at lunch time, while we worked like maniacs at our stations. I lived for a short while in the flat above and I doubt during that time that I ate anything but sandwiches or versions of. My favourite midnight feast though was to sneak down to the shop kitchens and toast a couple of slices of malted granary bread, spread gluttonously with far too much butter, pile with corn kernels and fold each piece in half like a kebab so the sweet yellow nuggets bathed in a pool of liquid butter, melted by the warmth of the crisp, chewy toast. Oh God, how I loved that naughty little snack. I’m a big fan of sweetcorn, but it has to be with butter. Forget the Caribbean way of grilling it with oil. Butter is its one-and-only as far as I’m concerned. This morning I had a craving for sweetcorn fritters, which I haven’t made for over 20 years, and haven’t eaten since my first ever meal at The Seafood Restaurant, also about 20 years ago, where I had a most heavenly dish of seared foie gras – rich and creamy with a perfect crust and smooth, chocolaty, buttery centre, sitting on top of a sweet and crunchy corn fritter, with a meaty madeira jus drizzled around. I can still remember every mouthful and it remains one of the best things I’ve ever eaten. Ironic given it was in a fish restaurant, but I don’t care. Cheers Rick! So at Deddington Farmers Market on Saturday I picked up a couple of heads of fresh corn, still lying on their fine bed of Rapunzel-like tresses and nestled inside their tight green coats. 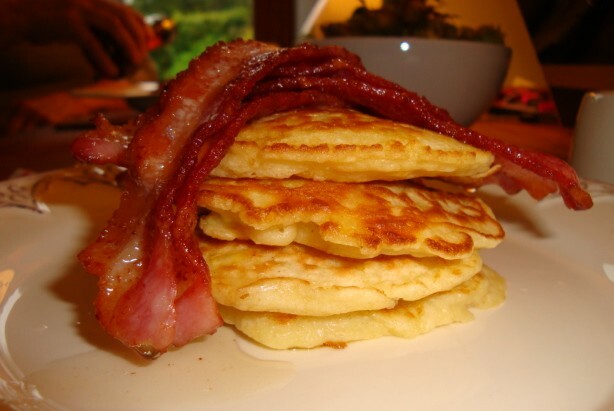 Mmmm, sweet fritters with salty bacon. Crispy and crunchy. 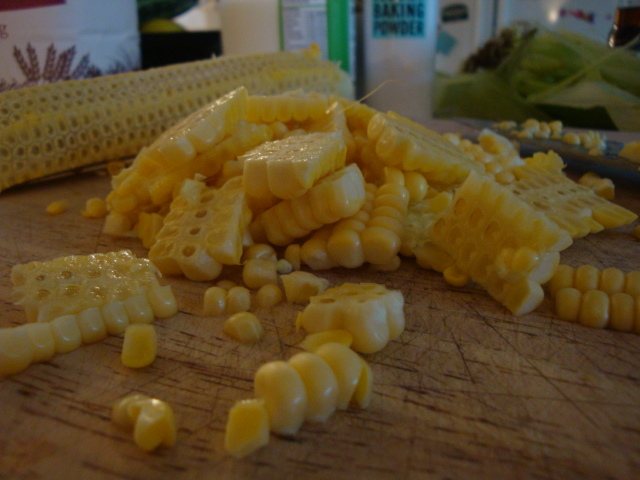 Holding the cob on its end cut the kernels off using a sharp knife. Put the flour and baking powder in a bowl then crack in the egg and combine with the flour gently using a whisk. Slowly add half the milk, whisking lightly to create a smooth batter. Add the corn kernels, a good pinch of salt and black pepper and then add more milk until you have the consistency of somewhere between double cream and custard. You might not need all the milk but you might need a bit more – depends on the size of your egg. Melt about 25 g butter in a non-stick frying pan over a medium heat. When it’s frothing add tablespoonfuls of the batter and fry for a couple of minutes until just golden, before flipping over and cook for another minute or so on the other side. You can keep them warm in a low oven if you want to while you cook the rest, but definitely scoff the first one as soon as it’s ready. Cook’s privileges! 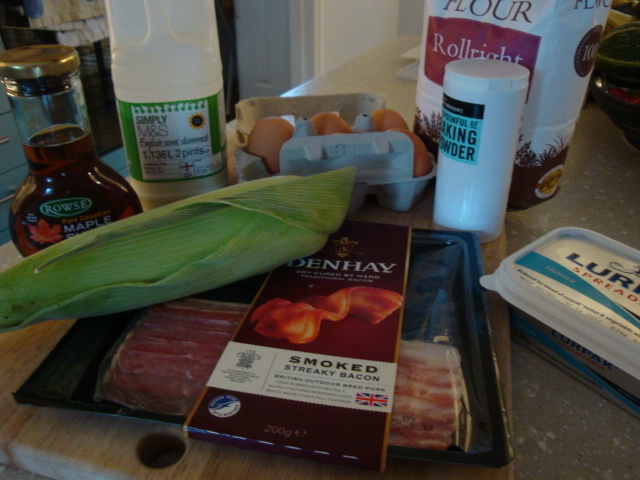 Then wipe the pan with some kitchen paper, add a splash of oil and fry the streaky bacon til crispy. 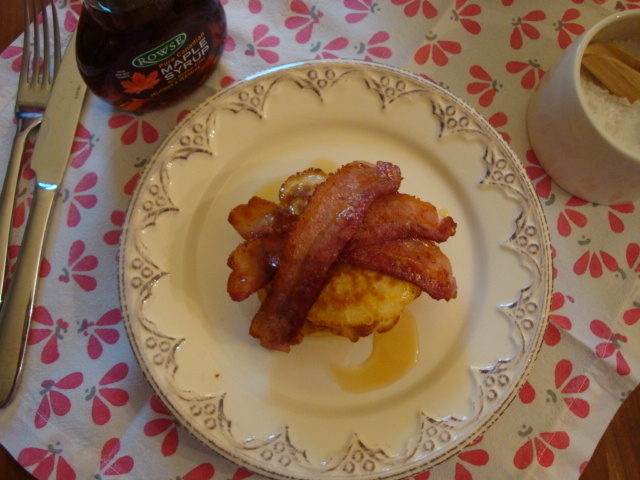 Pile the fritters on top of each other, then the rashers, drizzle a little maple syrup over and enjoy this plateful of autumnal, golden, crunchy yummyness. A perfect harvest breakfast. 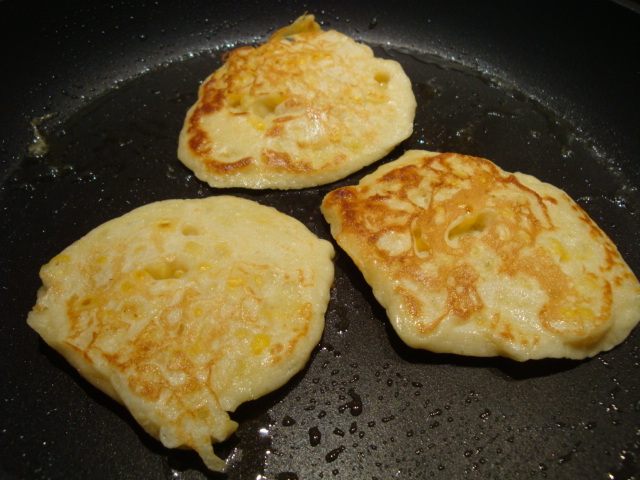 Posted in Recipes, Sweetcorn Fritters and tagged Recipes, Seafood Restaurant, Sweetcorn Fritters. Bookmark the permalink. You must promise me that you will make this for me next week! Or you can’t come! !